The big Reveal finally arrived today at Pine Belt Quilters. My "Shapes On The Green" tied for first place and then came in second in the runoff. 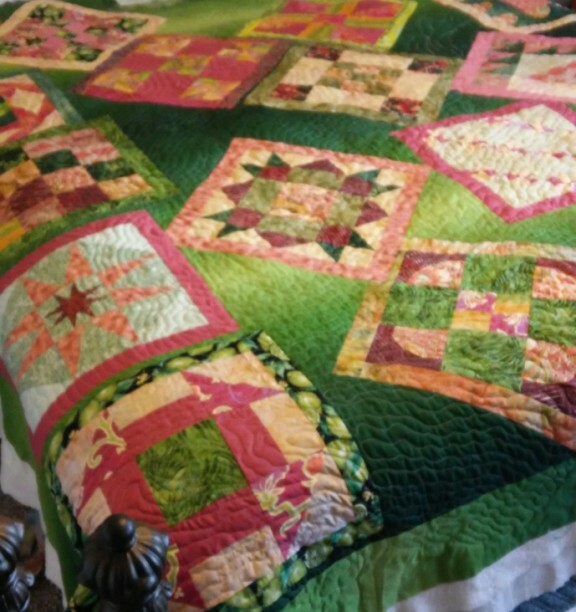 There were 20 awesome quilts--a real treat for all to see. They are pictured on the guild's website under the Guild Activities/Shapely Challenge tab. 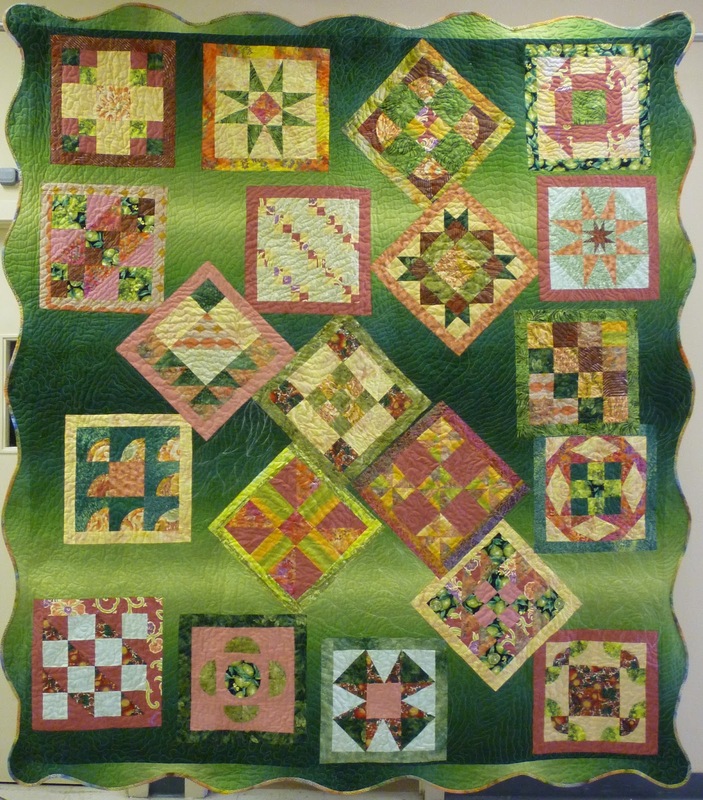 The year-long challenge was to make 20 twelve-inch blocks using required shapes (four blocks every two months), using five fat quarters for beginning fabrics and adding any other fabrics desired, as well as setting as we chose. The variety displayed in these finished quilts showed a lot of creativity in our guild. 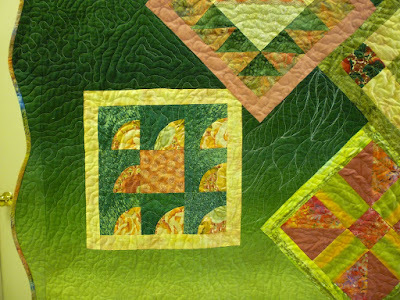 It makes us know we will have a beautiful quilt show this October! Although I generally make art quilts, this returning to pattern drafting and selecting fabrics for blocks was surprisingly satisfying. Adding the scalloped edge and hand-sewing the bias binding were good reminders of skills I had developed over the years. The quilt is 81" x 89." Here are the 20 blocks in rows. Row 5 is on top, then Rows 1, 2, 3, and 4. Row 1 shapes were only squares. Row 2 shapes were squares and half-square triangles (HSTs). 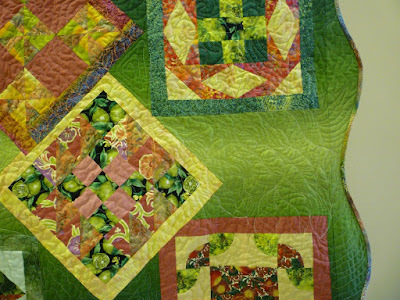 Row 3 shapes were squares, HSTs and rectangles. 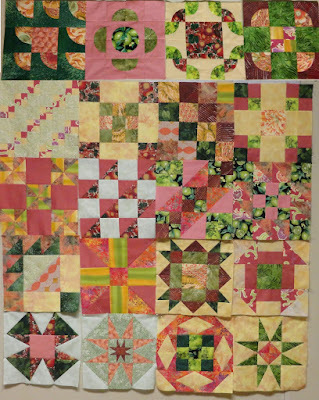 Row 4 shapes were squares,HSTs and tri-recs. Row 5 shapes were squares and concave/convex (as in Drunkard's Path). I added a 1-1/2" border to each block.